The theme “The Most Common Signs of Pain in Your Pet” helps us to understand that while we are different species, we ALL process and feel pain similarly. If something is thought to cause pain in humans it will likely produce pain in animals as well. 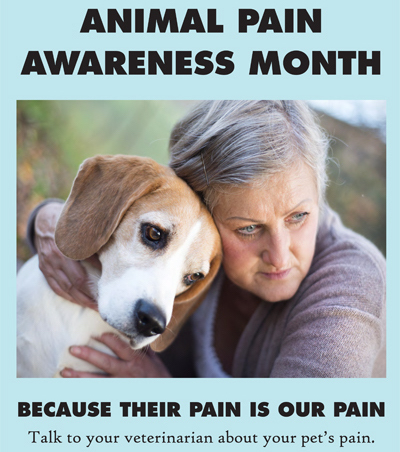 September is the perfect month to increase animal pain awareness as it coincides with with human medicine’s Pain Awareness Month. There are many signs to look for if you think your pet could possibly be in pain including decreased appetite, hiding in unusual places, unusual anti-social behavior, over grooming/under grooming, panting, restlessness and/or pacing, unusual clinginess, and decreased energy, just to name a few. More serious signs can be vomiting, diarrhea, limping, or extreme lethargy. We never want an animal to be in pain and encourage you to have your pet looked at by a veterinarian if you are noticing one or more of these signals. Annual wellness exams are a great preventative measure to take, but you know your pets best and can help us help them. Let’s keep your pets living a pain-free life!